What brings silence to the utter frenzy of the famous Palais des Festivals red carpet steps? The sight of 82 actresses and industry women marching up the stairs and then standing in solidarity en masse to bring attention to the disparity to the role of women at the legendary festival since its inception in 1946. Symbolically, 82 women gathered to make a point: this is the number of female directors who have been chosen for the main competition, in contrast to the 1,688 male counterparts in the same time period. The sharp difference in numbers effectively highlighted what women have been trying to address for decades: if you are not included in a festival such as Cannes you cannot win, you cannot compete and, clearly, your product has less chance of being discovered, purchased and promoted. That means an uneven playing field for the films women helm. It’s this kind of invisible effect of the unconscious boys’ club that results in fewer women in power positions and justifies unequal pay. If you don’t get the exposure and people don’t hear about your film, the box office suffers, and consequently, the chance of getting your projects financed is smaller. If they are funded at all they often receive smaller budgets and are held to more rigorous standards. 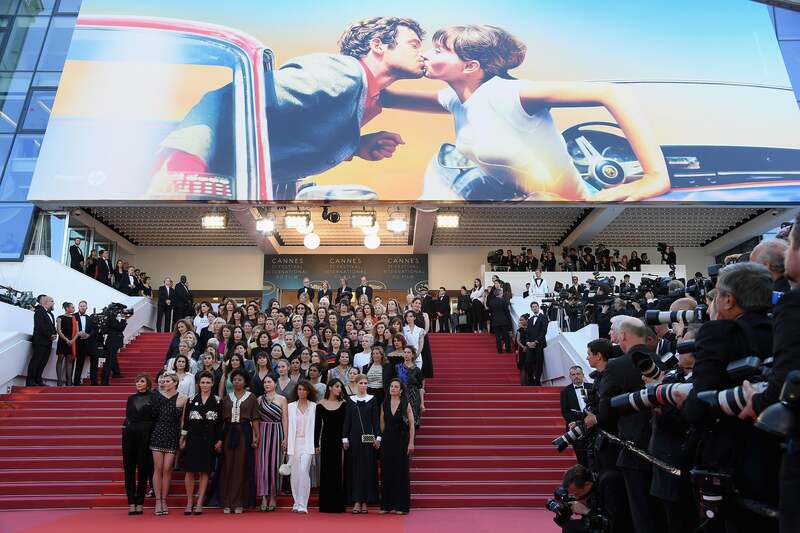 The Cannes gathering featured stars and leaders such as Cate Blanchett, Ava DuVernay, Marion Cotillard, Salma Hayek, Lea Seydoux, Leila Bekhti, Sofia Boutella, Patty Jenkins and Agnes Varda - the latter, one of only two directors to ever receive the Palme d’Or ( Jane Campion is the other recipient). Cate Blanchett speaks on the steps of the Palais. 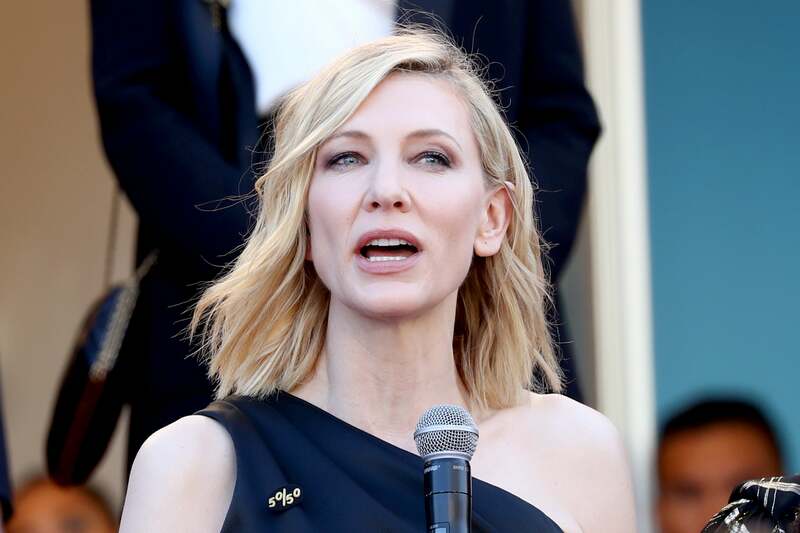 Bringing home the lack of representation, Blanchett made an impactful speech. 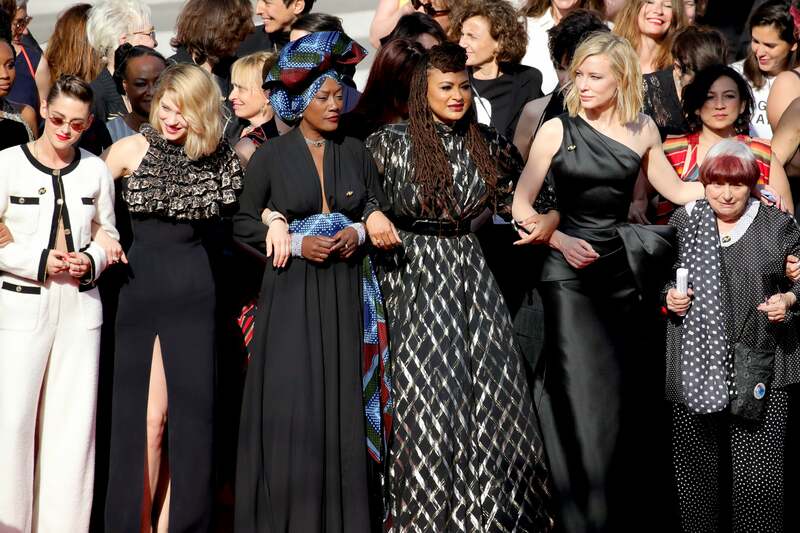 "On these steps today stand 82 women representing the number of female directors who have climbed these stairs since the first edition of the Cannes Film Festival in 1946. In the same period, 1688 male directors have climbed these very same stairs. In the 71 years of this world-renowned festival, there have been 12 female heads of its juries. The prestigious Palme d’Or has been bestowed upon 71 male directors - too numerous to mention by name - but only two women - Jane Campion, who is with us in spirit, and Agnès Varda who stands with us today," said Blanchett. "These facts are stark and undeniable. Women are not a minority in the world, yet the current state of our industry says otherwise. As women, we all face our own unique challenges, but we stand together on these stairs today as a symbol of our determination and commitment to progress. We are writers, producers, directors, actresses, cinematographers, talent agents, editors, distributors, sales agents and all involved in the cinematic arts. We stand in solidarity with women of all industries," they continued, before reading out a list of demands. "We will expect our institutions to actively provide parity and transparency in their executive bodies and safe environments in which to work. We will expect our governments to make sure that the laws of equal pay for equal work are upheld. We will demand that our workplaces are diverse and equitable so that they can best reflect the world in which we actually live. A world that allows all of us behind and in front of the camera to thrive shoulder to shoulder with our male colleagues. We acknowledge all of the women and men who are standing for change. The stairs of our industry must be accessible to all. Let’s climb." Kristen Stewart, Lea Seydoux, Khadja Nin, Ava DuVernay, Cate Blanchett and Agnes Varda walk the red carpet at the women's march. This year only three films in competition are directed by women, the first one being Eva Husson’s Girls of the Sun, about female Kurdish fighters (the other two are Alice Rohrwacher’s Lazzaro Felice and Nadine Labaki’s Capharnaum. Case in point, Girls in the Sun’s was the première chosen for the march. For those who could not enter the screening, monitors in the press area were crowded, with many women gathering in support of what was taking place outside. On Monday the French movement who organized the protest on the stairs, 5050x2020, is holding a conference in conjunction with other women’s groups such as Time’s Up, Dissenso Comune, CIMA and Greek Women’s Wave.